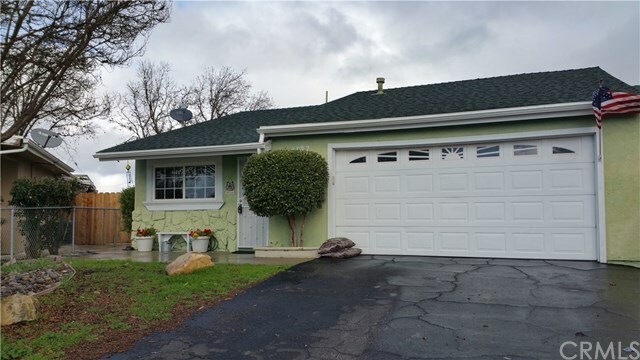 Cozy, charming 2bed/2bath cottage-style home in east Paso Robles. Sharing a common wall with neighbor, this property is priced to be a great starter home or investment property! Configured in a large "L" shape, the living areas of this home feature a large living room, wine bar, galley kitchen and a separate dining area which opens a covered, sheltered patio. The efficient kitchen is day-lit by a large skylight. Two covered patios overlook the large fenced backyard, which includes lovely raised garden beds (fenced to protect from pets). The large, bright master bed/bath opens to a covered patio through sliding door. Roofing materials, windows and doors have been updated and upgraded recently. Call your Realtor for a showing - this one will go fast! More photos coming soon! Directions: Linne Road to Airport Road. Left on Turtle Creek. OR - Creston Road to Meadow Lark. Go left to Airport Road. Left to Turtle Creek. Right to 1137 on the outside corner of Turtle Creek and Poppy on the left.